Wonderfully diverse selection of thumb pianos; from our pretty, decorated rainbow and flower designs to our wonderfully toned gourd and box constructions. Get those thumbs thumping! 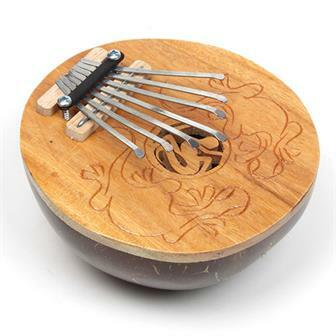 This thumb piano has seven metal keys attached to a coconut shell which acts as a resonating chamber; the staggered metal keys are struck using the thumbs to create the delightful characteristic tone of this traditionally African instrument. 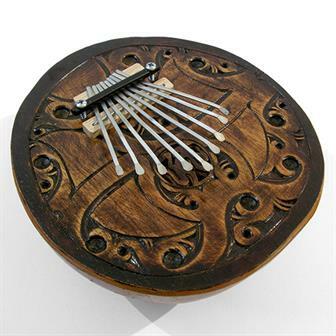 This beautifully carved thumb piano board has been placed over a polished half coconut. This creates a resonating chamber that produces a louder, more harmonically complex sound. 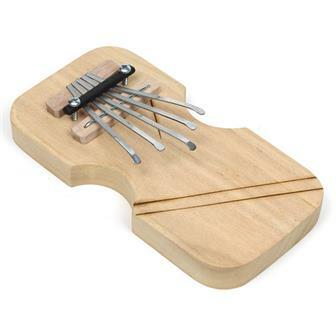 This is the simplest design of thumb piano we sell, its solid wood ergonomic based shape is decorated by burning designs into the wooden board. Solid wooden circular base in rich black with a simple adjustable tine arrangement. The tines can be tuned by carefully loosening the screws, moving the tines and re-tightening. 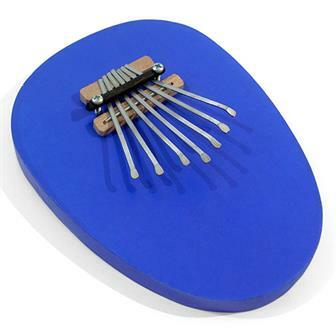 Solid wooden oval shaped base in deep blue with simple adjustable tine arrangement, the tines can be tuned by carefully loosening the screws, moving the tines and re-tightening. 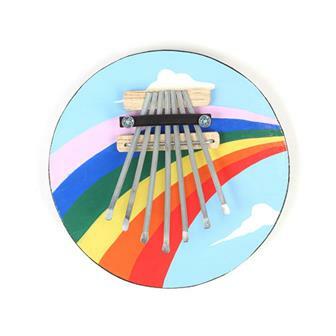 Solid wooden based thumb piano with pretty rainbow painted design. It has a simple adjustable tine arrangement, the tines can be tuned by carefully loosening the screws, moving the tines and re-tightening. Highly decorative and devilishly fun to play, this solid wood thumb piano has it all! 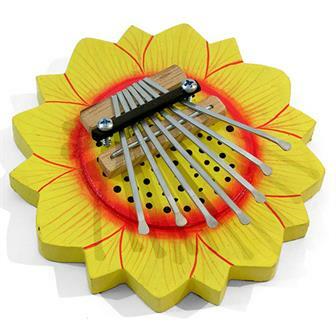 Hand carved and painted in Bali, it features seven adjustable tines so you can create your own scales to suit your playing style. Delightful dot painted thumb piano with seven metal prongs also known as tines. 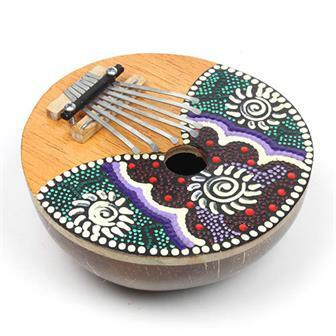 The characteristic sound of this traditionally African instrument is produced by striking the tines with ones thumbs. 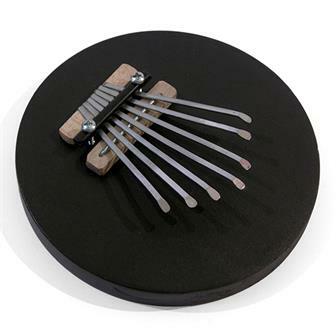 This thumb piano is mounted on a polished coconut resonating chamber which allows for louder and more harmonically interesting tones.